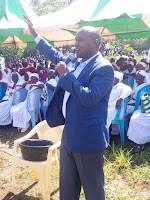 Friday November 9, 2018-Suna East MP, Junet Mohammed, has said Luo MPs are too busy to attend functions convened by Deputy President William Ruto. This is in reaction to this week’s Ruto’s visit to Homa Bay and Migori Counties where almost all ODM MPs skipped the event. Speaking yesterday, Junet claimed that public events convened by Ruto are not worth being attended by ODM legislators. He noted that the only events the MPs could honor are those convened by President Uhuru Kenyatta and Opposition Leader Raila Odinga, dismissing the Deputy President as nonentity. "We can only come to Migori when either President Uhuru or Raila are convening a meeting...but events convened by people with junior positions like Ruto and Obado cannot make me travel all the way from Nairobi to Migori," Mohamed said. The ODM lawmaker also dismissed projects launched by Ruto while in Nyanza on Monday as sketchy and not worthy the people of Luo Nyanza.